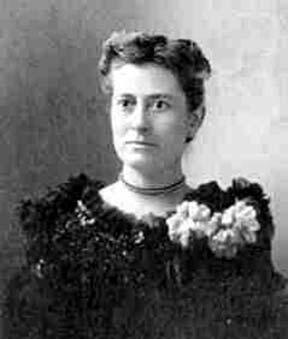 Friday, May 15, 2009 – Today we celebrate the 1857 birth on this date of Williamina Paton Stevens Fleming, who pioneered in the classification of stellar spectra and discovered the stars we now call white dwarfs. Now get this: she began by working as a maid for Harvard Observatory’s Edward Pickering, who then took her to the observatory to do clerical work. Fleming ended up cataloging over 10,000 stars for Harvard in a period 9 years. You go, girl! Tonight let’s head out into space where we might get a “blackeye.” You’ll find it located just 1 degree east-northeast of 35 Comae Berenices, and it is most often called M64 (RA 12 56 43 Dec +21 41 00). 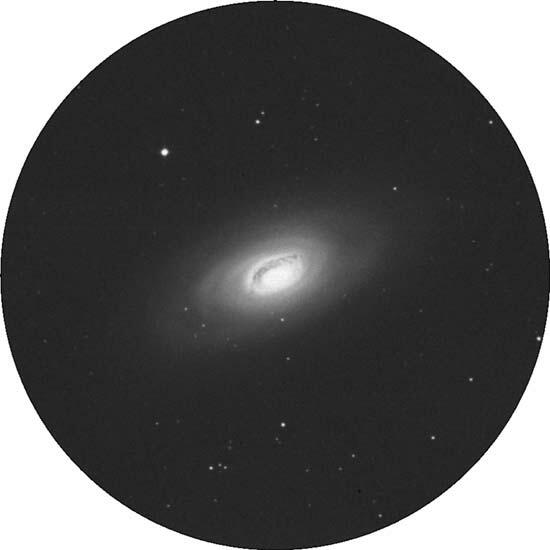 Discovered by Bode about a year before Messier cataloged it, M64 is about 25 million light years away and holds the distinction of being one of the more massive and luminous spiral galaxies. It has a very unusual structure and is classified as an ‘‘Sa’’ spiral in some catalogs and as an ‘‘Sb’’ in others. Overall, its arms are very smooth and show no real resolution to any scope, yet its bright nucleus has an incredible dark dust lane that consumes the northern and eastern regions around its core, giving rise to its nickname—the Blackeye Galaxy. In binoculars, you can perceive this 8.5-magnitude galaxy as a small oval with a slightly brighter center. Small telescope users will pick out the nucleus more easily, but it will require both magnification and careful attention to dark adaptation to catch the dust lane. In larger telescopes, the structure is easily apparent, and you may catch the outer wisps of arms on nights of exceptional seeing. No matter what you use to view it, this is one compact and bright little galaxy! Saturday, May 16, 2009 – Today we’d like to wish Roy Kerr a happy birthday! Born on this date in 1934, Kerr solved Einstein’s field equations of general relativity to describe rotating black holes, or the space/time around them. The solution, called now a Kerr black hole, shows a vortex-like region outside the event horizon known as the ergoregion. In this region, space and time are dragged around with the rotating parent black hole. 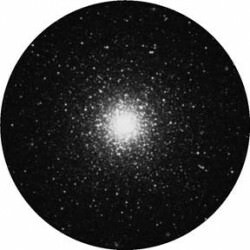 Tonight let’s use our binoculars and telescopes to hunt down one of the best globular clusters for the Northern Hemisphere— M3 (RA 13 42 11 Dec +28 22 31). You will discover this ancient beauty about halfway between the pair of Arcturus and Cor Caroli, just east of Beta Comae. The more aperture you use, the more stars you will resolve. Discovered by Charles Messier on May 3, 1764, this ball of approximately a half-million stars is one of the oldest formations in our galaxy. At around 40,000 light years away, the awesome M3 globular cluster spans about 220 light-years and is believed to be as much as 10 billion years old. To get a grasp on this concept, our own Sun is less than half that age! M3 is 40,000 years away, traveling at the speed of light; yet we can still see this great globular cluster. Now let’s locate M53 (RA 13 12 55 Dec +18 10 09), near Alpha Comae. Aim your binoculars or telescopes there and you will find M53 about a degree northeast. This very rich, magnitude 8.7 globular cluster is almost identical to M3, but look at what a difference an additional 25,000 light-years can make to how we see it! Binoculars can pick up a small, round, fuzzy patch, while larger telescopes will enjoy the compact bright core as well as resolution at the cluster’s outer edges. As a bonus for scopes, look 1 degree to the southeast for the peculiar round cluster NGC 5053. Classed as a very loose globular, this magnitude 10.5 grouping is one of the least luminous objects of its type, due to its small stellar population and the wide separation between members, yet its distance is almost the same as that of M3. Now, as the Sun rises, salute the 1837 birth of Sir Joseph Norman Lockyer, who discovered and named the element helium that he found in the Sun’s atmosphere, even before it had been detected on Earth. Lockyer was the first to coin the term chromosphere for the Sun’s outer layer and was the co-discoverer of solar prominences! Tonight we’ll return to 6 Coma Berenices, and head no more than a half degree southwest for another awesome galaxy— M99 (RA 12 18 49 Dec +14 25 00). Discovered by Pierre Mechain on the same night as he found M98, this is one of the largest and brightest of the spiral galaxies in the Virgo Cluster. Recognized second after M51 for its structure, Lord Rosse proclaimed it to be “a bright spiral with a star above.” It is an “Sc” class, and unlike its similarly structured neighbors, it rotates clockwise. Receding from us at 2,324 kilometers per second, its speedy retreat through the galaxy fields and close pass to approachingM98may be the reason that it is asymmetrical, with a wide arm extending to the southwest. Three documented supernovae have been recorded in M99—in 1967, 1972, and 1986. This week’s awesome images are (in order of appearance): Williamina Paton Stevens Fleming (historical image), M64: the Blackeye Galaxy, M3 and M53 (credit—Palomar Observatory, courtesy of Caltech), Sir Norman Lockyer (historical image) and M99 (credit—Palomar Observatory, courtesy of Caltech). We thank you so much! Great column, Tammy. Having just experienced that northern Ohio meteorological rarity known as “clearweekendwithoutafullmoon” your column is an excellent teaching aide for astronomical novices. Thanks. Next PostNext On Your Mark, Get Set, Let’s Find Planets!